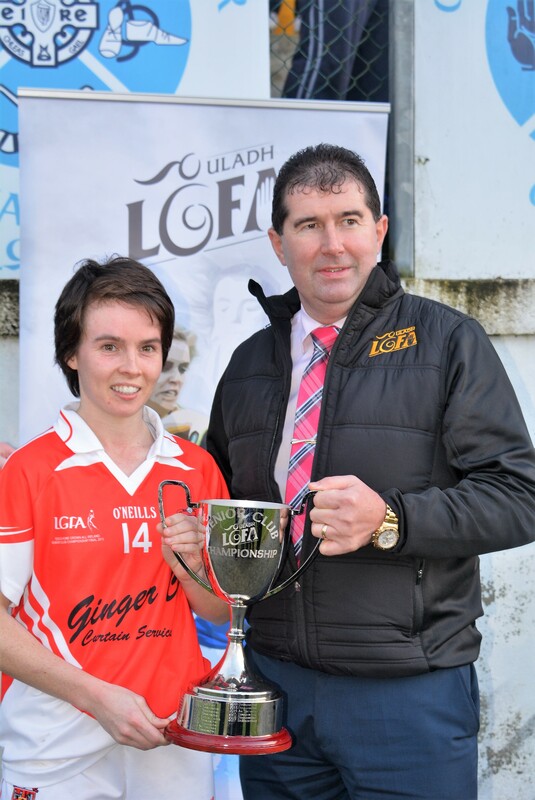 Cathriona Mc Connell fired over 9 points as Donaghmoyne claimed their 11th Ulster senior club title at the expense of Glenfin in Killyclogher on Saturday. The first half was a tight affair and only a goal separated the sides at the break with Donaghmoyne leading 1-4 to 0-4. Cathriona Mc Connell kicked all of their first half points while youngster Eimear Treanor who was selected to start late in the day scored a peach of a goal while cutting in from the left hand side. Glenfin's Yvonne Bonner hit a brace and All Star nominees Karen Guthrie and Katie Herron each fired over. Early in the second half only a point separted the sides however as the game went on Donaghmoyne showed their experience and found their scores a lot easier to come by. Glenfin's best chance for scores was to target Bonner in the full forward line however she seen little of the ball and when it did arrive she was doubled marked. The forward who is soon Australia bound added another 1-1 and Guthrie brought her tally to 4 with a hatrick of points but these were the only two Glenfin second half scorers. Donaghmoyne on the other hand had 7 different second half scorers including Mc Connell who added another 5 points. Former All Ireland champions Donaghmoyne march on and will play the Leinster champions next.